A WOKING hairdresser is starring in a reality show pitting professional avant garde stylista against each other. 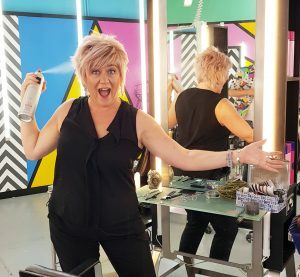 Donna O’Donoghue, who lives in Westfield, is a contestant on Extreme Hair Wars, which began on Thursday 20 September on Channel 5 Star. Donna ran a salon in Knaphill for 15 years and is now a styling teacher and does hair for special events. One of those was a Star Wars-themed wedding and another featured a bride as an Elvish princess from The Hobbit and The Lord of the Rings. She said the programme was “probably the most stressful, out-of-my-comfort-zone, experience I’ve ever had. “That bit you see on reality programmes where contestants are waiting to hear their fate – that went on for 45 minutes,” Donna said. She said she later learnt that the delay was caused by a heated argument between the judges and the show producers as to which contestant had to leave. “I’m hoping that will be shown,” she said.